Paper 1: A Theory of Perception. The central premise of this paper is that our experience of universe exists in the interaction between our psychology and the universe beyond our psychology, this interaction being mediated by our physiology. The starting question being can the physical universe beyond our experience in fact influence that experience? From the fact that it can and does then arises the core question addressed, namely is there some set of sufficient and necessary conditions of the universe without which perception is not possible and if so what are those conditions and how do they react with our physiology and psychology? The logic of the paper is to identify the extreme of perception, clear air whiteout where beyond which there is no perception then to add back elements such as to reconstitute the perceptual complexity of normal experience. The elements so added are then the necessary and sufficient conditions, the minimum external conditions necessary for perception to be possible. From the analysis initial conclusions are drawn on the emergence of intelligence in the universe, in particular that intelligence is a result of evolutionary response to the aspects of the universe necessary for perception in the same manner that mobility is a result of evolutionary response to distance. Questions addressed in this paper include the following. How can we understand perception? What exactly are the processes of perception? Does the reality beyond perception influence perception, and if so how? What is meant by the term 'reality beyond perception'? When and how is our psychology implicated in the perceptual process? Is any aspect of perception independent of our psychology? If so, how does this happen and what are the processes involved? And how can they be conceptualised? One of the difficulties encountered in this work is the problem of description. That is how can we discuss something without a label on it, and if we label it how do we avoid future prejudice generated by the label? And even beyond this, how do we analyse this process and account for it in detail so that it is precisely understood? For example, imagine watching an every day event such as a sports game. How can we discuss the perceptual processes while avoiding prejudice? If we use a term 'sport' we are already prejudiced because the term is human English, any psychological aspects of the perception are already determined by the term. The process adopted to manage this problem is to be cautious in using any terms that carry content. Thus what is sought are the necessary and sufficient conditions of perception that embrace all content, with the definition of the content relating to the species concerned. This does not and cannot eradicate the problem, for any such description is by its nature prejudicial. As will be shown the terms that arise relate to aspects of perception, with each aspect being a generic term embracing the detailed instances of that aspect as it arises in some particular circumstance. The 'external content' is described by the detailed instances of, and it is to this that terms such as 'sport' then apply. In this way the terms used in describing and necessary and sufficient conditions of perception are as the variables of perception, with the instances of those variables then describing the experience for the person or for some other species depending on the values and nature of the variables under consideration. The process adopted in this paper is to avoid pre-existing positions. Thus there is no 'conflict between two epistemology's' (1). What is sought is to understand and to conceptualise the processes of perception such as the relationship between the external and the internal is understood (2). What is herein sought is to approach the issues anew, understanding all that has gone before, but making no decisions and no judgements on it. As already discussed, the issue of words and descriptions is one that presents ongoing difficulties. The starting point of the paper is to define some terms that then provide a base of shared thought. The terms are all drawn from the existing literature and there appears little to debate. It is important that the terms are not seen as absolutes, they are used to convey concepts, the definitions merely ensuring that in this complex field the terms used are shared and understood. In all cases the terms are offered as variables that each classify a unique set of particular events. It is the events, that is the values of the variables that then give rise to the actual experience of the event. The analysis then proceeds by seeking the fundamental basis of perception. This embraced by the questions: does our physiology influence our perception? What is the precise relationship between objects beyond our senses and our physiology? Do we ever experience or perceive an object beyond our senses without involvement of our physiology? In answering these questions the paper introduces the concept of immediate perception, that is the physiological response to a perceptual field. With this base the paper then analyses the complete act of perception involving interpretation of the physiological immediate perception. Note that the term interpretation is not intended as a willed act. It may be willed, but also it can be virtually automatic where the changes in the neuro-physiology of perception trigger changes in other neuro-physiology that is fully psychological interpretation. The two systems of events being so conjoined as to be continuous. But, however, the term interpretation is still valid since it is an interpretation as per our physiology and any other intelligence with a different physiology would not experience the events in precisely the same manner. The final part of the paper is to analyse the psychological aspects of perception from the point of view of the necessary and sufficient conditions of the universe that enable such perception. The results lead to understanding of how our experience of the universe is constructed. The following definitions are intended to ensure that terms are used and understood in an established and shared manner. The definitions also enable analysis and discussion without some of the circularity referred to in the introduction. For now some of the definitions may seem arbitrary, and to some extent they are in that the term being defined can often be replaced with another, what is crucial is the concept conveyed by the term. A perceptual field is that aspect of the environment that will effect the sensory physiology of the selected species (3). The qualification is important, because we know that different species react to different stimuli. Thus a perceptual field is species specific, although some species may share a common perceptual structure. It is also a totally physical phenomenon. This makes the interpretation of any perceptual field totally an act of the observer (4). Any interpretation, however, goes beyond the immediate act of perception. The speed with which we can and do 'label', house, chair, table, etc, masks the fact that considerable processing is involved, and the physiological aspects of perception intertwined with the activation of thought. Beyond the perceptual field there are mechanisms that result in this perceptual field at this time and at this place. Thus a perceptual field is the result of states of Reality which have been, the delay being due to the sequence: state of Reality è perceptual field è perceived by the perceiving species, no matter how fast this sequence may be. The notion of 'mechanisms' becomes very important later in the analysis. In this paper I will show how perception of a dynamic universe is perception of the flow of change and that this result is general and can never be circumvented. A crucial consequence of this argument is that mechanisms can only ever be a concept and all that can ever be perceived are flows of change particularly when perceived as constant conjunctions. The term reality, small 'r', refers to that perceived by a perceiver. In the case of humans, it is the personal reality, their unique interpretation of the events. The term Reality, capital 'R', refers to that beyond a perceptual field. This distinction is based on the sequence: Reality è perceptual field è influence on the perceptual system of the perceiver è interpretation (reality experience). The first three steps in this sequence, Reality, perceptual field, and the changes in the perceptual system of the perceiver are all aspects of the physical universe. In the case of virtual reality, the reality may be trees and sky while the Reality is a computer. However, this terminology becomes cumbersome particular when a set is a member of itself, so henceforth I will use World 1 (5) as the term to denote the three aspects of the physical universe implicated in a perceptual event. Thus World 1 groups the physical aspects of Reality, perceptual field and physiology implicated in the perceptual event. The 'reacting part' (6) is a particular part of the physiology of a species involved directly with the environment. In humans it is known to be part of the brain and nervous system. The notion of environment is itself quite broad. For example, if we were studying some particular system within the human brain, say involved in visual perception, then the reacting part would be the visual neurones or some subset of the visual neurones. Then the notion of environment would include all the other parts of the brain. More will be made of the notion of reacting part. The fundamental questions can be put as follows: how does an external reality influence the perception of the human species? What are the steps in that influence? How can the influence be conceptualised? We know that sight perception depends on the flow of photons in through the pupils and absorbed in the retina. The photons are or exist beyond the confines of us, and without them there is no sight perception. The other senses can be discussed in a similar manner. Therefore with the operation of our senses we do know there is something there that can and is influencing the sensory mechanisms within ourselves, but we do not necessarily know what it is that is causing the sense experience. Modern virtual reality is testimony to the extent that our senses can be manipulated (7). It can be reasonably postulated that hearing, vision, smell etc, each involve different neurones (8). And that these perceptual systems can be active without involvement of any psychological factors (9). It is very difficult for people to engage in 'un-interpreted perception' (10). But it is possible for people to stop seeing a book as a book and to see it as lines, rectangle, parallelogram, etc. The question remains whether or not this is still interpretation, certainly it is more fundamental. However this particular aspect of the debate is not crucial to our argument. The key question is whether or not it is possible to perceive without being aware of doing so? For example, can we smell a smell without being conscious of the odour at the time? I believe so, and would recount examples myself where on discussing some incident I would recall, 'yes, I remember, but I did not notice at the time.' I argue this is not an uncommon or unusual experience (11). A consequence is to give rise to two levels of perception. The first is what I will call immediate perception, and is totally physical, the operation of the physical universe following its mechanistic pathways, some of which happen to occur as neural events in our brains. The second level of perception is the interpretative level where our psychology and attention is implicated in the perceptual act. Immediate perception is direct, mediated only by the physiology of the perceiving species. Moving beyond immediate perception, such as when a person attends to what they are perceiving (12), then all the well known aspects come to the fore (such as seeing an O when it is not fully closed, or not seeing a word repeated in a sentence). A problem is the terminology, for now we have 'immediate perception', strictly physiologically driven, and the more normal 'perception', involving the psychological factors. I will use the term 'perception' to refer to the complete act of 'perceiving', and involving the psychological factors. Where I need to refer to the more restrictive physiological reacting part only, then I shall use the term 'immediate perception' (13). The obvious consequence is that we do not necessarily perceive that which we immediately perceive � with no contradiction in terms. 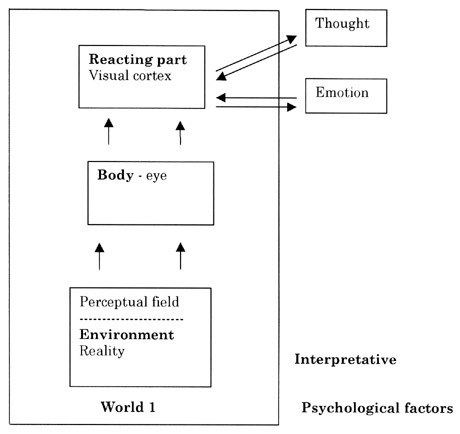 The diagram below is a conceptual schematic of the process of immediate perception. The mechanisms of immediate perception are a set of physical events in the physical universe, labelled World 1 as per the earlier stated convention. The external Reality is generating a perceptual field that is influencing the eye, which in turn is influencing the neurones of the visual cortex. The visual cortex is the reacting part. This reacting part has other aspects to its environment, namely it can influence and be influenced by other parts of the brain and central nervous system represented by arrows from the visual cortex to 'thought' and 'emotion'. The arrows in the diagram mean 'able to have a direct effect upon' (14). The system within the box labelled World 1 is the model of immediate perception as developed thus far. The interaction of the visual cortex with other parts of the brain and central nervous system represented by the arrows to thought and emotion, is the beginning of the analysis of the complete act of perception involving the emotive and interpretative elements. Thus far, there seems little to sensibly debate. We have built a model of immediate perception that says that we immediately perceive Reality via a perceptual field, and even more specifically, we immediately perceive reality via the effect a perceptual field has on sensory apparatus of our physiology. If the perceptual field has no effect on our physiology, in particular if we were observing a perceptual field and that field changed yet that change could not or at least did not effect our physiology then for us there was no change. The universe would remain as it was prior to the change. Furthermore, this conclusion is general and applies to all species. We also know that at least for humans there is another whole dimension to the perceptual act involving the interpretation and classification of perceptual events. However, for now we have the base needed for us to proceed to the next step, and do not need to consider the issues of perception involving psychology. This will be done later when we have fully reviewed the issues and implications of our immediate interaction with perceptual fields. All I seek to establish is, first, that, for example sight perception is not possible without photons, and second, that photons influence the neurones involved in sight, and third that this can occur without there being any interpretation and without involving attention. The fourth and final point might be that this analysis of sight applies to all senses, and that the analysis applies to all species, each species being effected by the perceptual fields relative to their physiology. There exists a Reality able to generate and influence perceptual fields. There exists physiology able to be influenced by the perceptual fields arising from and effected by Reality. There exist physiological states arising from the effects of perceptual fields on sensory physiology. And that these states are fully physical states of atoms and molecules and as such are part of Reality. Separate from the above physiological perceptual states there are interpretations of those states, which then provide interpretations of Reality. (Here there are two factors, the neurones that underlie the interpretations and the interpretations themselves. The first is part of Reality, the second is part of psychology, the precise conceptualising of these, how they arise and the relationship between them, is one of the aims of this philosophy). Then we can ask the following questions. Are there any sufficient and necessary conditions of a perceptual field that must be fulfilled before perception is possible? How could these conditions be conceptualised? Is this underlying perceptual structure of Reality universal? That is, applicable to all species? How does this underlying structure of Reality that gives rise to perception relate to and effect the creation of knowledge? Must there be any minimum neurological circumstances within a species for knowledge to be created at all? Analysing the events of every day existence is difficult because if there are some aspects of Reality that do underlie perception then seeking to analyse everyday experience is to seek to analyse those factors at their most complex. This will inevitably make unravelling the factors difficult if not impossible. The approach adopted here is to seek clarification at the other extreme of perception that is to identify the exact point at which perception fails then to add back the elements progressively building back to the extreme of perception we experience in everyday life. In this process it is anticipated that we will identify what the elements are, how they interact and how we in fact build our conscious experience of Reality. Furthermore, because this analysis is independent of the observer, it is a necessary state of affairs for all intelligent species. The question now is what must be the nature of the perceptual field for perception to be possible? Conversely, are there any states of a perceptual field where perception fails? An obvious failure of sight perception is the absence of photons. However, this does not tell us enough of the interaction between our physiology and a perceptual field. Are there other circumstances where perception fails that afford greater insight into the process and mechanisms involved? There is one such set of quite dramatic circumstances where perception fails that is in clear air white out condition (15). Clear air white out occurs in circumstances of clear air, it is not loss of visual perception through any form of interference (fog, smog, cloud, rain, and snow). In fact it is not loss of visual perception at all, rather it is the total loss of depth perception. The effect is of seeing a flat white plane, but the person does not know that is what they are seeing. The effect can be reproduced in the laboratory, and is called 'ganzfeld' effect (16). This is where subjects were placed in an apparatus that simulated a uniform visual field. They described the experience of a loss of visual perception. The psychological situation is identical to the total absence of photons. In the dark, vision is not lost; it is reduced to a flat, black plane. Because it is dark, we know it is a flat black plane and do not think of ourselves as 'seeing'. In clear air white out, we experience the similar phenomena, merely with a different colour (17). An explanation for these circumstances is found in systems theory. It can be shown that zero input has the same effect as constant input (18). Given that immediate perception is a physical system, then the total absence of photons will have the same effect as immersion in a field of constant photons (19). The explanation is that the constant input has the effect of establishing a constant activation, this results in a dissociation of the visual set of neurones from other systems of neurones. It is important to recognise that a person in clear air white out is not making interpretative choices. In the absence of experience of clear air white out the person will interpret what they 'see' as a clear, empty stretch of space. If they know that there 'should' be trees or mountains then they may become suspicious of what they are 'seeing'. Any accurate interpretation however is far from instinctive and would draw on factors not immediately implicated in the perceptual field (such as a 'sense' of what should be there and is not). How do we now rebuild the perceptual field such that we recreate the structure of 'normal' perceptual experience? Clearly this is not a question that relates in any way to our psychology. It is solely a question pertaining to the necessary state of the perceptual field that must exist for perception as normally encountered to be possible. This is not even a question of philosophy, rather it is a systematic question of scientific analysis, with any answer expected to be testable and expected to be subjected to empirical testing and scrutiny. The question we must now turn to can be stated, what must be the state of a perceptual field for perception to be possible? What has been established is that the nature of the perceptual field in and of itself does profoundly influence perception. We have stripped that influence down to its minimum elements, that is that in the dark and in a field of totally uniform photons we cannot see Reality. Perception being dominated by a perceptual field that is not perceptually congruent with the Reality beyond the field (that is, reality does not reflect Reality). And that a perceptual field must have certain characteristics for perception to be possible. We have not analysed what these are, but have established what they are not. For perception to be possible, then the perceptual field must not be uniform. The hypothesis is that for immediate perception to be possible then the perceptual field must be differentiated with respect to the physiological mechanisms of the perceiving species. It can now be asked what types of differentiation can there be? It turns out that this is a particularly important question. It is the answer to this question that leads to a scientific definition of scientific knowledge and provides the basis of a definition of cause. By scientific knowledge I mean that knowledge intended to provide prediction and explanation of the universe. Thus the solution to the problem of a theory of knowledge is not produced by examining knowledge, but by analysing the precursors that must exist in the perceptual field for knowledge to be in fact possible. And this analysis of the perceptual field is quite independent of the perceiving species. Visualise two areas of a perceptual field A and B, and ask in what way can A and B differ? Technically, it is a perceptual field we need to analyse; however the thought experiment is easier if we talk in terms of Reality. So, for instance, visualise a beach scene, then imagine two squares, small in relation to the overall scene, and constructed such that what they each encompassed was uniform. Thus we have a scene and two uniform but different parts of it divided off. If a perceptual field must be differentiated, how can these two parts of this scene be different, that difference conveying the nature of the differentiation necessary for a perceptual field if perception is to be possible? We could reduce the two squares to points, as is often common in physics. However as I will show, doing this in fact eliminates a crucial type of differentiation. We simply do not see points, they are only notional, and are not the base from which it is possible to build a model of the necessary state of a perceptual field for normal perception to be possible. I have only been able to conceptualise three ways in which a perceptual field can be differentiated. These three are able to explain all other emergent features, nor have I established argument from first principle whereby these three types of differentiation are established. The validity of these three was established in retrospect, in the manner of trial and error and I present them as a working hypothesis. First, A and B may completely overlap or may be separate, thus there can be spatial differentiation. The second manner in which A and B can differ is in colour, or texture, or form or shape etc. I call this aesthetic differentiation. The final manner in which A and B can differ, is that A can change (20), I call this dynamic differentiation. Each of these will now be considered in greater detail. Imagine looking a flat, white plane, as in looking at a sheet of white paper. But not merely looking at it, actually in the plane, living as if that flat white plane was all there was. This is the situation of clear air white out. Perception is reduced to the stage where all that exists are photons coming from different directions. We would and do remain aware that it is a plane, but there is no depth, no colour and no difference between one point on the plane and every other. Below this minimum level of perception, there is no perception. It is very important to also understand that this is a property of the perceptual field and is not some interpretation by the observer. This result is independent of the nature of the perceptual modality. If the observer or observing species has perceptual mechanisms within their physiology aligned to the perceptual field, and if that field is in the above state, then the result will be as described within that modality for that species. The observer does not get the choice or luxury of making their own interpretations. A and B can differ in form or colour or texture, provided the differentiation of Reality generates differences in the perceptual field. Colour is the obvious difference. It is colour, even black and white, that initially generates other aspects of the aesthetic world, for in the absence of colour, or in the presence of a completely uniform colour, as in clear air white out, perception reverts to a flat, undifferentiated plane. It is also important to understand that this plane is not Reality, which can consist of mountains, trees, valleys, but because of the perceptual field being generated, they cannot be seen. Only by inserting colour, and colour of a sufficient percentage (see the footnote on suggested virtual reality experiments to establish this percentage) is the shape and other aesthetic qualities of Reality re-asserted. Imagine looking at a painting, not only looking at it, but also where the painting was all there was. The living environment was as a painting, but of course it would not be living at all. There is an important paradox in perceiving the universe as a painting, namely what is happening within the physiology of the perceiver for it to see the universe at all? If the state of the perceptual physiology of the perceiver is constant, then perception reduces to a flat, undifferentiated plane. Therefore perceiving the universe as a painting means that the perceptual systems of the perceiver are not constant, which means they must be changing. The nature of the change is important, it can be thought of as a situation of constant, repetitive activity in that when observing a painting the perceptual field is differentiated but static producing differentiated but repetitive activity within the sensory physiology. This activity is necessarily repetitive since the same scene is being observed with no change within the scene itself. The point is important because it stresses we are reaching the stage where the observer can no longer be ignored and where perception is not merely a function of the perceptual field but a result of the interaction of the perceptual field with the physiology of the perceiver. The manner in which an observer enters the philosophy will be discussed more fully in a later section. However, it is now clear, in that thus far we have only discussed undifferentiated or unclassified change, it is at the point of defining the type or nature of the change that then defines the observer. To perceive the universe as a painting requires that change exist within the physiology of the perceiver. In a truly static universe there can only be the void. In this section I will establish change and particularly change sequences as a fundamental of the universe. It is this fundamental that is the whetstone of evolution resulting in intelligence. This in the same manner as distance contributed to the evolution of effective means of locomotion. Questions to be explored include what is change? What is a change sequence? How can we understand change in relation to perception? Is all change perceived? Imagine, again, the universe as a painting, with two generally uniform segregated areas A and B. Now imagine A changed, say it changed colour. What would be the effect of this? The result would be that the observer would now have a point of reference within their history in the painting. This point is also very important. For without this point of reference, does or can time exist within the painting? I argue the answer is no. The observer within the painting because they, to observe at all must have a physiology that changes, can only have a notion of time based wholly on their internal psychology. The term change I will restrict to referring to a transition from one state to another within World 1. Thus a change is a physical occurrence. It can be a change in the state of Reality, or in the perceptual field, or, for sight perception, a change in the visual cortex. Is change a necessary aspect of perception of a dynamic universe? We have already explored perception of Reality as a painting. The conclusion that if nothing changes in Reality or the perceptual field then the physiology of a species is changing but in such a way as to result in a constant perceptual image (in the case of sight). Change once begun, will flow through the mechanisms of the universe and produce ongoing results that may or may not be available to the perception of any particular species. What a species perceives is change relative to the physiology of the sensory systems. And this includes any machines designed to extend the range of perception available for they are simply devices for turning changes not able to be influence the sensory physiology into changes that can. Thus there can be ongoing change cascading through the mechanisms of the universe but only able to be perceived at certain times or in certain ways by any particular species. An analogy might be observing a mountain range shrouded in fog and only peaks high enough able to be seen. This is in fact the case when human species observe a painting, there is much atomic activity, but it is below the level of the given perceptual systems and requires machines if it is to be observed. We can now say that in the absence of change relative to the physiology of the perceiving species then for that species the universe would seem as in a painting. We now also begin to see how perceived change relates to both Reality and perceptual fields. And that there can be and is much change occurring but perception is restricted to those changes able to influence the sensory physiology or influence machines designed to extend the perceptual abilities of the species. How can we understand a change sequence or a flow of change? The analogy of the mountains shrouded in fog help to visualise the idea of the flow of change. Imagine the fog slowly retreating down the mountains. First one peak would come into view then a second, and so on. So as change flows through the mechanisms of the universe so one change is perceived, then a second. Each change being that part of the working of the mechanisms able to effect the sensory physiology (including machines). It can be and often is the mere tip of the changes occurring. Where two such changes are frequently encountered, such as the sun rising and setting and the coming of day and night, then we have what Hume described as a 'constant conjunction'. And from the analysis of Hume we know that there is no basis for cause in such constant conjunctions. But now we can understand why, in that we can see that any such change events merely the tips of two peaks, with much intervening mechanism frequently not available to perception. Any changes in the mechanism could invalidate the assumption that B does follow A. Must the analysis above follow? Or put another way, must perception of a dynamic universe occur via the perception of change? In the absence of change there is only a static universe, as a painting. If the universe is changing but in such a way as it does not influence the sensory physiology of the perceiving species, then again for that species there is no change and the universe is static as in a painting. These circumstances are inescapable. The conclusion is that change is the basis of perception of a dynamic universe. Further, that this position does not depend on the species involved. A general proposition has been developed as follows: in the absence of change relative to the physiology of the observer, then that observer can only perceive the universe as in a painting. And this applies to all observers. I argue that this is as close to an 'observer independent' description as can be achieved. It is restricted to a general notion of change. As soon as we seek to answer the question 'what change?' then the observer must be specified, or is implicitly specified by the change specified. This must be so because of the necessary relationship between the physiology (including machines) the perceptual field and Reality. For example, a desert snake and a person observing the same phenomenon in the desert that immediately perceived by the snake will be quite different from that immediately perceived by the person. What happens if the change is classified? Before addressing this question we should briefly examine how the change is classified. For example, a given change can involve a set point in space, with aspects colour, form, size and shape, and with some rate of change in any or all of the aforementioned qualities. These I call the properties of the change. Given two species with widely varying physiology then it is simple to imagine some change in Reality and perceptual field that will be perceived quite differently by the two species. This difference being determined by the properties of the change able to be registered by the physiology of each of the species. The situation can be pictured in the diagram below. Rate of change of any of the above. The nature of the change immediately perceived by the observer is determined by those properties of the change able to effect the physiology of the observer. Changes in Reality or perceptual fields. Physiology of an observer able to be influenced by some qualities of Reality and perceptual fields and not others. As an important aside, the three types of differentiation, spatial, dynamic and aesthetic embrace all aspects of science, and all possible properties of change. Currently the classification of the properties of change is first, location in space, second dynamic differentiation that has the property of the rate of change. Finally, all other properties are grouped into that I call aesthetic differentiation. This is convenient, but not crucial for the argument does not rest on any particular method of classifying the properties of change. In summary, the classification adopted here is (1) space, (2) time(21) and (3) everything else. What is it that an observer must 'see'? How can the nature of an observer's perception be understood and how does it relate to the Reality and perceptual field from which it is abstracted? I use the term 'abstract', because it is now clear in what manner the physiology of the observer does in fact 'abstract' from Reality and perceptual fields. Returning to the analogy of the mountain range shrouded in fog, the peaks visible represent those changes with properties able to influence the physiology of the observing species. And these peaks are in fact selected from the whole range of mountains by the physiology of the observer represented by the fog. I do not wish to take the analogy too far, only to make visual and graphic the process of physiological abstraction in the perception of certain changes in a certain way. We can now ask are there any conceivable circumstances where immediate perception can be any other way? The only other way being where the whole mountain range is perceived without fog? And how do we ever know there is no fog? That is, how can we ever be sure that what we perceive is not in some manner shaped and bounded by our physiology? I suggest that we cannot be sure, and that it is impossible to perceive and not be bounded by physiology or machines intended to extend our physiology. (In this context a machine is simply a device to push the fog from peaks otherwise shrouded.) This restriction, arrived at solely on the basis of physiology becomes very important when we consider the question of what we can and cannot know of the universe. The position that arises can be summarised as follows. In any change relationship where B follows A, represented by A è B A and B are seen as the 'observable peaks' with much hidden particularly the details of the mechanism of how a change in A results in a change in B. Imagine we examine the details of this mechanism and discover A' and B' whereby A è B proceeds, A è A' è B' è B. We now have three pairs of 'peaks' � A è A', A' è B', B' è B. I suggest that each of these bears the same relation to the perceptual field and to Reality as the original A è B, that is a pair of 'observable peaks' with much hidden. In particular the mechanism of how the first change effects the second. I argue that this is a universal situation and that at every level of detail what is uncovered is a more detailed set of changes with more detailed properties. That there is much that is always hidden from our perception, in particular the mechanism of how the change relationship, the constant conjunction of Hume comes to be. The final question is how do we understand immediate perception? What set of changes give rise to it? In striving to make clear the sequence of events that give rise to perception it is difficult to avoid the sequence Realityè perceptual fieldè effect on the physiology of the observer this then is interpreted by the observer. Imagine Realityè physiology that is Reality directly influenced the physiology of the observing species. But this is incomprehensible, we know the photons are responsible for sight perception, pressure variations in air for sound etc. And we know that in the absence of any pressure variation in the air we do not hear anything. Three types of change can now be distinguished. First, changes in Reality, second changes in the perceptual field, third changes in the observer as a result of the changes in the perceptual field. Without change in the perceiving structures of the observing species there is no observation, regardless the state of the perceptual field. Here again, it does not seem possible for there to be any other position. For it to be otherwise would mean we were able to perceive Reality, or at least achieve congruence between our internal image of Reality, our personal reality and Reality without there being any form of communication between our physiology and Reality. I believe that where our physiology is unchanged, then our psychology is unchanged (22). The changes are first, changes in the physical state of the neurones. A human observer is not able to register these changes, only their consequence. Thus, the changes result in the first instance in a change in the visual image (for sight perception). This change is available to attention, and may or may not be attended to. The perception of a change in Reality exists of three interrelated changes in the system I have classified as World 1. First a change in Reality, second a change in the perceptual field, third a change in the perceptual physiology of the observer. All three are necessary. These interrelated changes are the physical, World 1 mechanisms of immediate perception. We have discussed change and discussed how the properties of change as noted by the observer define that which is perceived. But how are change and perception tied together? And in this instance, how do humans tie the two together? Are there any concepts that can be used that simplify understanding of this situation? In relation to changes in Reality and or perceptual fields a consequence of that change how can we establish a system of definitions and concepts that give precision to these relationships and issues? As a start point we can identify three linked changes in Reality, perceptual field and sensory physiology, plus the possibility of changes in the perceptual system, giving rise to an interpretation by the observer. This gives rise to four distinct possibilities for defining an event. Changes in Reality accompanied by changes in the perceptual field. Changes in Reality, perceptual field and changes in the perceptual systems of the observer. Changes in Reality, perceptual field, perceptual systems plus an interpretation by the observer. Situations three and four differ in that in four, the observer does make an interpretation whereas in three the observer does not, but could if the changes were noted, or could in retrospect on reviewing the events later. The question now is at what level is an event to be defined? Typically, events have been regarded as being at the first or second levels. That is, they are changes in Reality and or perceptual fields. Thus and event is identified with change, supposedly objective and observer independent. Is this appropriate? Does it fit with what happens? If this definition is retained, then at situation three we must introduce the idea of observation of an event, and at situation four, the observation and interpretation of an event. This is a reasonable system of definitions. The problem I suggest is that the term event already implies some level of classification and interpretation. We do not discuss events in the abstract terms of unclassified change, but in the concrete terms of a label describing what happened. There is a more significant argument, namely that unless the change in Reality generates a change in a perceptual field able to influence and create changes in the physiology of the observer, then there can be no observation. To that extent, any change in Reality not able to influence the physiology of the observing species effectively does not exist for that species. This position includes machines designed to extend the perceptual range of the species. The question now is at what point does an observation occur? Change in the observer's physiology is essential. The observer is necessarily involved in an event, and if not then for them there was no event. The interpretation does not have to have been made at the time, but the changes in Reality and perceptual field must produce changes in the physiology of the observer and if they do not then there was no event. This leads to the definition of as event as the observer's immediate perception of change (23). The basis of an event is thus physical change in Reality, the perceptual field or the perceptual system of the observer. Change in the perceptual system of the observer is both physiological and potentially psychological. An event is first an immediate perception, consisting solely of changes in World 1, all physical. In a person, the physical change in the perceptual system is not able to be noted only the effect of that change. In the first instance, that effect is an alteration of the visual image. This occurs whether or not that image is being or was attended to. Further changes may then occur, but these involve more than the reacting part of immediate perception, they involve the full notion of perception as involving interpretation. We can now consider what happens when we observe a painting. There is no change within the painting itself, it is static, but there is change within the observer because we know from the analysis of white out that if there is no change, that is if the physiology of the observer is constant then perception reduces to minimum levels. The aesthetically and spatially differentiated painting is generating the change in the observer (24). Finally, what is the status of situations one and two above? That is changes in Reality or a perceptual field or both. Consider the question: if a tree falls in a forest with no one there did it make a noise? Given the definition of an event, then the answer is that there was a change in Reality (a tree fell). This resulted in changes in the atmosphere (a pressure wave), there are changes in Reality and in the perceptual field, but without the change in the observer, there is no event. Hence there is no noise when the tree fell. This may seem somewhat pedantic, however it is conceptually precise, and in more complex situations, says regarding the interpretation of modern physics this precision becomes very important. In the absence of an observer, there is no event. There can be and are changes in Reality, and the effects of those changes may be observed at some later date (25). Then it can be speculated that an event occurred which produced the observed effects. But such observations are speculative on the part of the observer, and no amount of observation, research or study can eliminate all the uncertainty associated with them. No degree of probability gives to certainty. All perception is observer relative because immediate perception, the World 1 changes the basis of all perception, includes changes in the perceptual system of the observer. An event consists of these changes. For the notion of noise the involvement of the observer, the observer relative nature of the event is obvious. But what of the objects of science, are they also observer relative? Consider such objects of Reality as 'photon', or 'molecule' or 'atom'. Typically these are reported as being objectively 'out there'. But these events have no reality unless they generate change in the physiology of the observing species. They remain as much expressions of the observer's experience as the term 'noise'. We know that these objects are only perceived at all if they are changes in some way. They are certain types of change, regularly observed and noted such that they are classified. The difference between an atom and noise is that an atom involves a collective agreement as to its properties, whereas noise is defined in a much more personal sense. The issue we now need to consider is how the classification of events comes into being? What processes are involved and how do those processes result in the structures of knowledge we use to classify events? It is the notion of the property of events that plays a crucial role in the classifying of them. For science it is the collective agreement, for example on the definition of an atom, that enables an intelligence, in this case human intelligence, to create an objective assessment of Reality from the multitude of subjective experiences. These questions are the subject of the next paper in this series. Changes with similar properties are grouped by those properties and called events. All events are unique to the observer, but able to be shared if the second observer shares the classifications. Within the theory all acts of perception are events. Thus as I sit and allow my mind to drift and reflect, the view through my study window is of a tree dappled by the sun flowing through the canopy above. The leaves glisten and rustle in a gentle summer breeze. In this scene, what is the event? The event is every detail and the whole scene, both. One large perceptual event consisting of a multitude of smaller, and smaller perceptual events. The whole containing detail to which I do not attend, but when I do my instinct says that I knew it was there. Like the full red apples on the tree to the right, with the two heavily pecked by the wax eyes that bustle about the trees in the backyard. In my contemplation through the window I do not always see the apple tree. But it registers as an event in me. It is most important to also understand that we now move beyond immediate perception and into the full perceptual process. The EVENT being defined by both immediate perception and by my classifying that which I am seeing or thinking about. Thus I can allow my mind to draw back, and then the event is the whole view, within which much detail is lost. Or I can focus, and select the detail that then becomes the EVENT. What I see is not merely trees, dappled and rustling but most importantly an 'instance of', in part measured against all other instances of, adding much richness to the experience of this EVENT because I know the gentle yet sharp brilliance of a this still summer's day is rare. In its most simple form, an event is a set of interrelated changes in a physical system, a perceptual field and the physiology of the observer. It is precisely this set of changes at this time in these circumstances, with this precise state of each system (Reality, the perceptual field, the physiology of the observer). The result is that every event is unique. For example, at this very moment, a particular photon is being absorbed by your perceptual system. This event can never repeated, even with the exact same photon, because this also requires that all three systems be in exactly the same state. This is precluded by the fact that your perceptual system has absorbed the photon before. That is you have read this material and any second reading will not be identical as a consequence. We now need to consider the issue of precisely what properties define what events. For example, we can use a chair as a table. This means that some of the properties of a table are common to a chair (or at least some chairs). In everyday experience this duplicity is not a problem, however it is an issue in science and will explore it in a later paper. Any perception of Reality is typically discussed in terms of objects, not events. What is an object and how does it relate to an event? An event is defined by its properties, some or all of which are changing. The rate of change for an event is greater than zero. However, technically rate of change is a measurable variable, and there is no reason why it cannot be zero. When we identify an event with a rate of change of zero, then we have something with a set of properties that do not change. This 'something' is defined as an object. Thus an object is an event with the rate of change of the properties as zero. There are now several important considerations. First, it means that an object is fixed in time and space, which is not how we usually regard an object. We can have an object with only one or a small number of its properties changing. For example, an apple becoming ripe, increasing in size, juiciness and changing from green to red. In this example all the properties changing are aesthetic properties, and we do not see the apple as the same. The object is in the same place, but undergoes transitions. At each stage, that which then exists bears a definite relationship with that which can emerge, so there is a continuity, which in this example we know and understand. If we were in a situation where we did not know and understand, and if the changes were sufficiently radical, we may not 'see' the continuity. And would regard that which we observed at each stage as a 'new object' that had somehow replaced the old. A second example is an apple falling from a tree where it is the location of the apple in space that is changing, it can be said that it is still the same apple, an object, undergoing some event, falling from a tree. If we adopt this point of view, it means within the definition of an object we are separating the properties said to pertain to the object from the properties of time and place. This is valid to the extent that the properties of the object are all aspects of aesthetic differentiation, where time and place are aspects of the dynamic differentiation and spatial differentiation. So we talk of an object at some place at some time, assuming that any translation in space and time does not alter the properties whereby we define the object, so that at some other place at some future time it is still the same object (assuming no other factors). It is crucial to see the object as defined by its properties derived from aesthetic differentiation but excluding dynamic and spatial differentiation, and to see this as a sometime convenience. In the case of an apple it is perhaps not an issue of any serious import. In the case of an elementary particle where properties derived from aesthetic differentiation (for example wavelength, mass) are not necessarily independent of properties of space and change or at least their independence can not be simply assumed. There are two other issues that arise from this definition of an object. That is as an event with the rate of change of all properties as zero, that is if the properties are changing very slowly or very fast repetitive change such as a light flashing on and off. In both cases what may be seen as an object, with definite and fixed properties is not. It is strictly an event, but the rate of change of the properties of the event relative to our physiology are such as to result in our perceiving that rate of change as zero. In everyday circumstances this is seldom an issue. It is also not an issue if we retain an appreciation that what appears to be a zero rate of change may be either a very slow or very fast rate of change, and assess the properties on that basis. We have developed a general theory of perception where the necessary conditions of Reality and perceptual fields relates in a known and now understood way with the physiology of an observer. The nature of that interaction is summarised in the definition of an event, that is a set of changes in Reality and or perceptual fields with some properties of the change able to influence the sensory physiology of the observing species. The recording of each and every event has no survival value since it can only be a record, and offer no prediction of Reality. Prediction can only occur if and only if events are recorded as generalisations, with a particular event being an 'instance of '. This in turn is only of survival value if the organism is able to respond appropriately. At that point it can be said that the organism has 'learned'. Immediate perception of an event can also trigger a habituated response. This may have been due to the species being repeatedly subjected to such events, and for the species to develop a response enabling it to survive. Or the response may be genetic, such as the fight or flee response. A response to an event can be learned as a habit. As such it cannot be said that 'knowledge' is involved. Such responses involve no judgement. What can be said of the evolution of intelligence, more specifically the evolution of mind in the sense of a human type of mind? Evolution does not work in isolation; it works against or in relation to something in the environment. It is the tension between the factor in the species and the factor in the environment that generates the changes in the species. So distance gives rise to mobility in the species, and if that is a factor in survival, that is if those individuals of a species with greater mobility survive more frequently and so reproduce more often then the gene pool of the species moves toward the greater mobility. What is here proposed is that the differentiated aspects of the universe are as much part of the universe as distance. In particular dynamic differentiation is a natural part of that with which all species must cope. Change is at once a challenge and an opportunity for all species. Given the thrust of evolution to produce a species that makes the best possible use of all facets of the environment, there would appear some inevitability that there would emerge a species with the physiology to note, classify and record events enabling that species to predict changes in Reality. If the species could develop and adopt course of action based upon prior experience that was conceptual and not embodied in the gene pool, this would give significant acceleration to the process of survival since improvements in survival could occur within a generation and not depend on the cycle of reproduction for evolution of the species. The philosophy thus far leaves many questions yet to answer. How precisely can we understand the process of knowledge creation? What precisely do we have when we have created knowledge? That is, what is the relationship between that which is created, knowledge, and that represented by that knowledge, Reality or some object of it? What are the minimum yet sufficient physiological structures that could give rise to the creation of knowledge? How does the theory account for scientific knowledge? What is scientific knowledge? What is a theory? What is a variable? How does a theory and a variable relate to an event? What is reduction of knowledge? And can we have ultimate knowledge and ultimate truth (in the sense of having nothing not known)? The application of the above theory to these questions is the focus of subsequent papers. See The Monist, vol.81, No.3, July 1998. Specifically Moser, Paul K. Epistemological Fission: On Unity and Diversity in Epistemology, pp 353-370. In this, the process is implicitly seeking the 'explanatory unity' described by Paul Moser. For example, some event may release the full spectrum of electro-magnetic radiation, but for humans the 'perceptual field' is restricted to the range of visible light which is that part of the spectrum able to influence our sensory physiology. There are other ways of defining these circumstances; this way has the virtue of retaining the involvement of the observer. This communication fact is often overlooked, and is an aspect I emphasised in business and personal development workshops. Even the words on this page come to you as a perceptual field. My task as a communicator is to structure that perceptual fields bearing in mind your likely reactions and understanding, such that I convey as near as I can the message and the ideas and the meaning I seek. Popper, Karl. Objective Knowledge: An Evolutionary Approach. Oxford: Oxford University Pres, 1972. Ashby, W. Ross. Design for a Brain. London: Chapman Hall, 1960. In the case of virtual reality the computer is Reality and because of the situation we know there is no congruence between reality and Reality. It is not difficult to imagine situations where we did not know the reality was computer generated, at which point we would act according to a reality that bore no resemblance to Reality. Gazzaniga, Michael S. (Editor). The Cognitive Neurosciences. Mass:MIT Press,1995. This idea is supported by modern thinking, for example �'in vision it is believed that elementary features such as colour, orientation, size and movement are coded in parallel (-processing mechanisms) at a pre-attentive stage, whereas perceptual discrimination and object identification based on these features require focal attention and rely on the processing resources of a general-purpose, limited capacity mechanism'. Magnussen,S. and Greenless,M.W. Journal of Experimental Psychology: Human Perception and Performance 1997, vol.23, o. 6, 1663-1616. Palmer, in Norman 1975. Norman, D.A. and Rumelhart,D.E. Explorations in Cognition. San Francisco: W.H.Freeman. See Anderson,R.C. and Prichert, J.W. Recall of previously unrecallable information following a shift in perspective. J.Verb.Learn.Verb.Behav.1978, 17, 1-12 for an interesting account of how attitude alters perception. I used the example of 'what you see when you look at a house to buy or burgle' in dozens of workshops to make the point of how attitude can shape what one sees, and business and personal opportunity begins with our attitude. The term 'immediate perception' could be replaced by, say 'physiological perception', however this felt too narrow on the grounds that 'immediate perception' could be understood as physical, but also implied the existence of the image, which is there to be noted if we attend to it. The physiological term seemed to me not to so comfortably carry this implication. Ibid Ashby, 1960. He developed concepts of ultimate and immediate effects. The arrows are immediate effects, strictly stating that a change in A is immediately followed by a change in B, and denoted A è B.
Sater, J.E. (Editor). The Artic Basin. Washington. The Artic Institute of North America. 1969. Sater summarises it so:.."whiteout can occur in a crystal-clear atmosphere under a cloud ceiling, with ample, comfortable light and a visual field filled with trees, telephone poles, quonset huts, and oil drums and such relatively small objects�. The entire visual continuum is erased by whiteout � all vestiges of depth perception may be lost�and one not know". The effect on judgement is demonstrated in the Air New Zealand Mt Erebus disaster where 257 people died, a contributing factor believed to be clear air whiteout conditions (Mahon, P.T. 1981 NZ Royal Commission to enquire into the crash on Mount Erebus, Antarctica of a DC10 operated by Air New Zealand Ltd. Wellington: New Zealand Government Printer). This disaster and my research into contributed to this philosophy when I concluded that if Reality could have such an effect, it had to be explicable. Cohen concluded:.."It may be conjectured that the perceptual mechanism has evolved to cope with a differentiated field, and, in the absence of differentiation, there is a temporary breakdown of the mechanism". Cohen, W. Spatial and Textural Characteristics of the Ganzfeld. Am.J.Psych., 70, 403-410, 1957. With modern virtual reality technology, this theory and philosophy can be tested much more effectively. For example, black (absence of photons) and white have been tested, but what of other colours? And what types of differentiation, what percentage of the perceptual field needs to be differentiated? And can the differentiation be spread evenly or must it be localised as is inferred, etc? Ashby,W.Ross. Introduction to Cybernetics. New York: John Wiley. 1956. I have focused on sight, with the assumption that the other perceptual mechanisms will be similar. See Bertrand Russell, the History of Western Philosophy, London: George Allen and Unwin, 1961, for a review and account of the history of the philosophy of change. Change is here offered as the basis of time. As has been discussed, in observing a painting the observer can only know of time via their internal psychology. Change in Reality or a perceptual field able to be noted by an observer then offers a basis of time not less dependent on the observer, or as independent as any event is able to be. This is based on the premise that all our psychology is rooted in the physiology of the brain. And while we may not understand the relations and how neural changes result in psychological changes, it is assumed that some form of congruence between neural events and psychological events does necessarily exist. See Casati, Roberto and Varzi, Achille C. (Editors) Events. Vermont: Dartmouth Publishing, 1996, for a discussion of the philosophy of events. There is the beginning of discussions on the interrelationship between perception, conceptualisation and Reality. If we were to use machines able to observe a painting at the atomic level, then we would observe change and hence events. This reinforces the notion of a natural level of perception for each species based on its physiology. And extension to smaller and larger events requires machines. This situation can be discussed as an event on the basis of 'if a person had been there they would have experienced such and such'. No matter how obvious or supposedly certain, this is merely a theory of the event, for the actual event did not occur. Copyright © 1999 Graham R. Little. Web Site Problems? email the WebMaster.